With winter giving way to a beautiful, in-bloom spring, now is the perfect time of year to get outside and explore our French Quarter neighborhood. Whether you’re outdoorsy, intrigued by history, or just plain hungry, there are plenty of things to do in the French Quarter this spring. Woldenberg Park is a sprawling greenspace on the banks of the Mississippi. 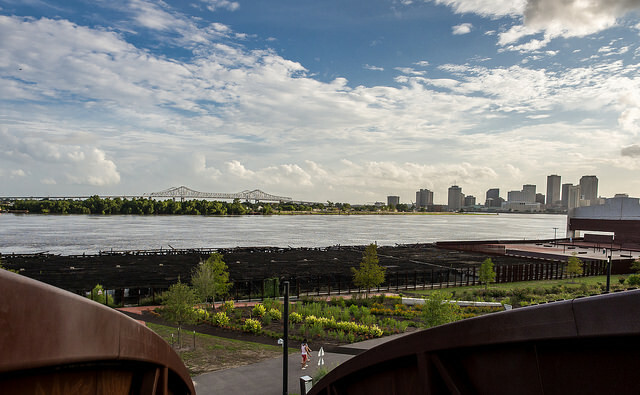 Located on the riverside edge of the French Quarter, this park features a riverside jogging path, peaceful oak trees, and an up-close view of the Mississippi River. Just down the river from the French Quarter, you’ll also find Crescent Park, which offers an incredible view of the New Orleans skyline despite being deceptively close to the French Quarter. Featuring sculptural installations and outdoor seating, the park is a photographer’s dream. Plan to bring your camera! In New Orleans, crawfish season is a magical time of year. Learn to peel these delicious little “freshwater lobsters,” then head to one of the many places to eat crawfish in the French Quarter, including Deanie’s Seafood on Iberville Street where you can get them boiled fresh at market price. If you prefer slurping to peeling, try oysters. Acme Oyster House is as iconic as it is delicious – it’s been a French Quarter staple for more than 100 years. Central Grocery on Decatur Street serves up incredible muffulettas – take one to go and eat it in Jackson Square! For a more literal take on going to the grocery store, we suggest heading to the Rouse’s Market at 701 Royal Street in the French Quarter. You’ll find Louisiana- and New Orleans-specific goods perfect for souvenirs – bring back regional foods like Zapp’s potato chips (we’re partial to the Voodoo flavor), Creole-style chicory coffee, and spice mixes for your friends and family. Spring in New Orleans offers a plethora of festivals and events to choose from, including two of the biggest and best: French Quarter Festival and Jazz Fest. If you’re here during French Quarter Festival (April 12-15, 2018) you’ll be able to walk outside into our historic neighborhood and listen to some of the best local music acts for free. Expect to see local favorites like Aaron Neville, Big Sam’s Funky Nation, Amanda Shaw, Irma Thomas, Kermit Ruffins & the Barbecue Swingers and many more. While Jazz Fest (April 27 – May 6, 2018) takes place outside of the French Quarter, it’s worth the trek to the Fairgrounds to see local and national artists like Stevie Wonder, Tom Petty & The Heartbreakers, Maroon 5, Kings of Leon, Meghan Trainor, Lorde, Snoop Dogg, Alabama Shakes, Pitbull, Wilco, Widespread Panic, Patti LaBelle, Aaron Neville, Elle King, Dr. John, and Earth, Wind & Fire, and hundreds more. 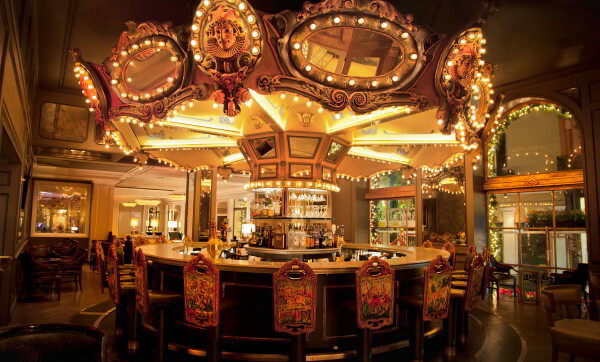 The Carousel Bar & Lounge at Hotel Monteleone is the only revolving bar in New Orleans. The French Quarter is one of the most historic neighborhoods in the nation. In fact, many of the buildings in our neighborhood date back to before this country became a nation. For example, the Old Ursuline Convent is the oldest building in the Mississippi River Valley. Built on Chartres Street in 1752, it’s the oldest example of the French colonial period still standing in the United States. The Louisiana Purchase was signed in the Cabildo, one of the buildings located at the center of Jackson Square. If you’re looking for a historic place to grab a cocktail, you’ve got plenty of options. Lafitte’s Blacksmith Shop, once owned by the pirate Jean Lafitte, serves up cold brews in one of the oldest buildings in the city. Our very own sister property, Hotel Monteleone, dates back to 1886 and has hosted famous authors like Truman Capote, William Faulkner and Tennessee Williams. Have a drink at The Carousel Bar in their honor. 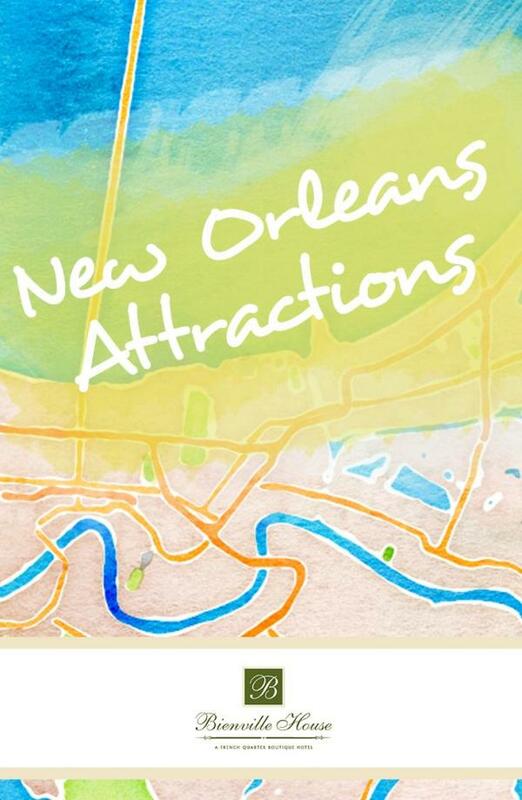 Ready to Explore the French Quarter this Spring? There’s no better place to stay in New Orleans than Bienville House, located in the heart of the French Quarter. You’ll love our convenient location, services and amenities and our on-site Tiki-themed bar and restaurant, Latitude 29.